1891 Census shows the house occupied by William Hall, Ironmonger, and his wife, mother-in-law and a 13 year old servant. 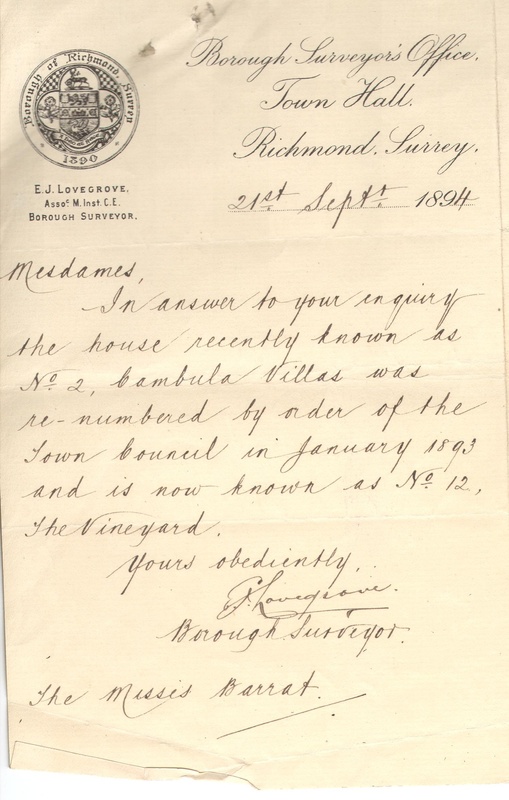 1893 In January, 2 Cambula Villas was renumbered by Richmond Council and was now known as No 12 The Vineyard. The Fourth City Mutual Benefit Building Society obtained judgement in the High Court against Richardson and others for possession of Cambula House, Richmond. The Fourth City Mutual Benefit Building Society assigned the lease of No 2 Cambula Villas to The Misses Barrat (Eliza & Hephzibah, spinsters) for £450. The Borough Surveyor proposed an improvement plan for the Vineyard to widen the road by virtually halving the front gardens of 12 & 14 The Vineyard. The plan shows a building on the adjoining Queen Elizabeth Almshouses land that would have to be demolished as it jutted out beyond the building line. 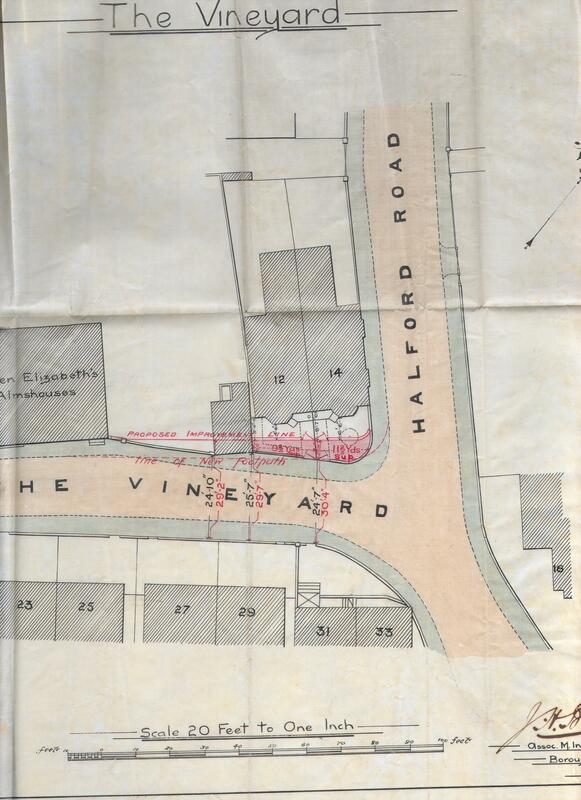 It also shows No 16 on the opposite side of Halford Road which is now No 20. Census: 12 The Vineyard occupied by Eliza Barrat, 56, and Hephzibah Barrat, 51, both ‘living on own means’. The Misses Barrat assigned the lease of 12 The Vineyard to Mr W A Bashford of 21 Eton St, Richmond, a schoolmaster for £320. Augusta Lucy Bashford, widow of the retired schoolmaster William Alfred Bashford, assented in the vesting in herself of 12 (recently renumbered 16) The Vineyard. The personal representatives of the late Augusta Lucy Bashford assented to the vesting of all her property in H F Wallington, retired Tennis Coach. Abstract of the Title of The Governor of St Olav's & St Saviours grammar school foundation Bermondsey and Southwark to freehold property including most of Halford Road and 12 & 14 The Vineyard. All freehold land to be transferred to the Official Trustee of Charity Funds. Order by the Minister of Education allowing St Olav's & St Saviours grammar school foundation to sell within one year the freehold interest in their properties. Conveyance by The Official Trustee of Charity Funds of the freehold of 16 The Vineyard to H F Wallington Esq..